This instrument, invented by Jacob Amsler (1823-1912) was used for computing the area enclosed by a closed curve. The arm OB (first figure below) has a pivot point in O which is fixed to the paper. 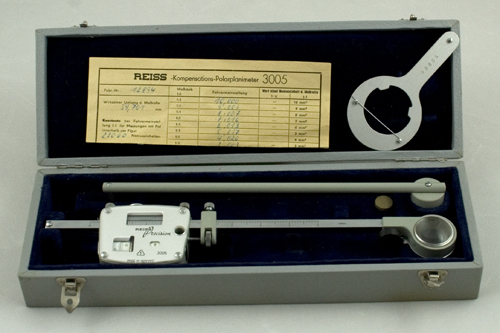 In our Siemens planimeter (top figure), O is a sharp point pressed into the paper by a weight. Point B, which can describe a circle around O, rests in turn on a point of the arm AC. Point A is is moved by the user along the curve drawn on the paper. The other end of this arm rests on the paper with a steel wheel W, the axis of which is accurately parallel to AC. (In the Siemens planimeter, W is on the other side of A; also there is a supporting wheel perpendicular to W). The rotation of W can be measured accurately with the help of a division on its rim and a revolution counter. If AC is moved in its own direction, W slips over the paper without turning. However any movement component n normal to AC leads to a proportional rotation of W.
if higher order terms are neglected (l is the length of AB). Two polar planimeters: Siemens & Halske (made by A. Blankenburg), Germany ~1930 and Allbrit/Stanley, UK 1950. Inset bottom left: detail of S & H planimeter mechanism. References: this explanation was adapted from the ENSIE encyclopedia (Amsterdam 1949). The top picture was taken from our Siemens Spezial-Planimeter manual (Berlin 1928). Prof. Dr. Joachim Fischer (München) provided a number of corrections and additions. A mathematical treatment of the planimeter, based on Green's Theorem, is given in this Wikipedia article.